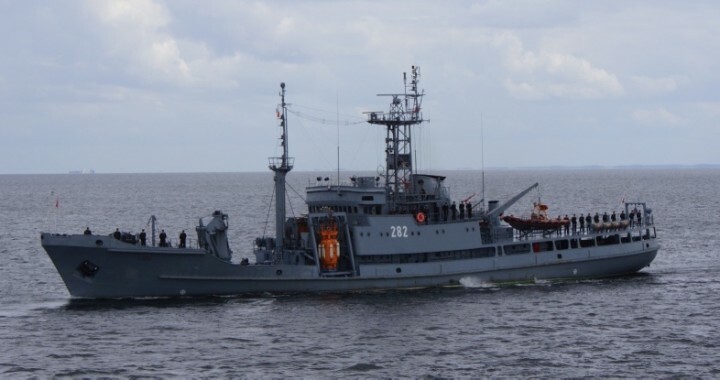 2013 r. ORP Lech - Foundation "Odnalezc Orla"
On June 3, 2013, the Polish Navy Navy’s ORP “Lech” salvage ship departed from the Port of Gdynia with the mission of investigating the wreck of a submarine located in the North Sea by Polish hydrographers. There was a high probability that the wreck resting on the bottom of the North Sea could be a Polish submarine ORP “Eagle”. They indicated the initial sonar images of the craft, in particular its dimensions corresponding to the size of the legendary Polish ship, as well as the apparent technical details. After locating the exact location of the wreck, it was thoroughly investigated by modern sonar and underwater robot. Submersed into the water to carry out a detailed survey of the wreckage. Collected as a result of the described work, the materials were subjected to numerous analyzes and comparisons. They showed that the submarine wreck, however, was not a sought after Polish ORP “Eagle”, and a wreck of a British submarine sunk in the last weeks of the First World War – HMS “J6”. The cruise with ORP “Lech” ended on June 10, 2014.